Automatic Storage System consists of mechanic, electrical, control and management system, which covers all aspects of modern logistic technology, such as motion control, PLC control, database and network technology, etc. 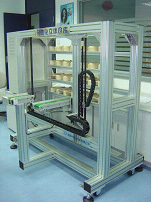 It is the indispensable subsystem of realizing modern automatic manufacturing and automatic logistic system. The automatic storage system developed by Googol Technology is based on storages systems that are similar to industrial ones.